Most of us would not set out on a truck camping adventure without a working refrigerator, cooktop/oven, furnace, water heater, or water pump. This short list of vital major appliances can instantly make or break a truck camping trip. We can all get by without a working microwave, but a broken water pump or refrigerator is a deal breaker. Given the critical importance of these major appliances, we know a good number of truck camper owners who have upgraded these components for improved quality, reliability, and performance. We too have upgraded quite a few components in our thirteen year old project truck camper. 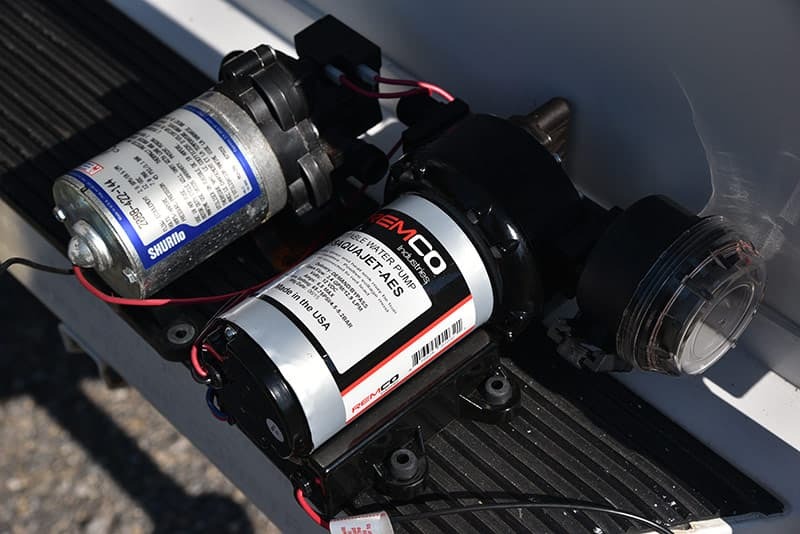 For improved performance and lower noise, we worked with famed 12-volt pirate and artilleryman, John Wells, to upgrade our water pump to a Remco AquaJet. The original SHURflo pump was long past its prime and sounded like a herd of stampeding elephants. The variable-speed Remco AquaJet works like a champ, and brought the noise level down to more acceptable levels. While we were installing the Remco, we also took the opportunity to install a winterizing kit. That has been one of the best additions to our truck camper thus far. We also replaced our Suburban water heater with a more current Suburban SW6DE model. That experience was initially successful, but was ultimately frustrating as we chased a resulting propane odor inside our camper for weeks. Eventually we got the problem resolved by the manufacturer (a mismatched replacement shroud), but we were not confident enough in the product installation to showcase the result in Truck Camper Magazine. Caulk that one up to a learning experience. Earlier this year, Mike Tassinari (aka Mikeee) helped us to apply a spray-on rubber coating to the underbody of our project truck camper. Immediately after completing that considerable task, we asked Mikeee to help us install a Dinosaur Electronics control board on our Dometic refrigerator. Mikeee had advised us that RV refrigerator control boards are notorious for going out at the worst times, and replacement was inevitable given the 13-year age of our unit. As of now, our Dometic refrigerator, Atwood cooktop oven, and Atwood furnace, are original. We have considered upgrading the refrigerator to a 12-volt compressor model when our existing unit fails, but it’s not otherwise a priority. The Atwood cooktop oven and furnace continue to operate without issue. Excuse me as I go knock on a cord of wood, or two. We are specifically asking about your truck camper’s refrigerator, cooktop/oven, furnace, water heater, or water pump. If you have upgraded one of these appliances, tell us what you upgraded to, and whether the upgrade was worthwhile. Use our above examples as a guide for the kind of feedback we’re looking for. Please fill out the form below to share any appliance upgrades. Home » Truck Camper Magazine Blog » Have You Upgraded Any Major Appliances?